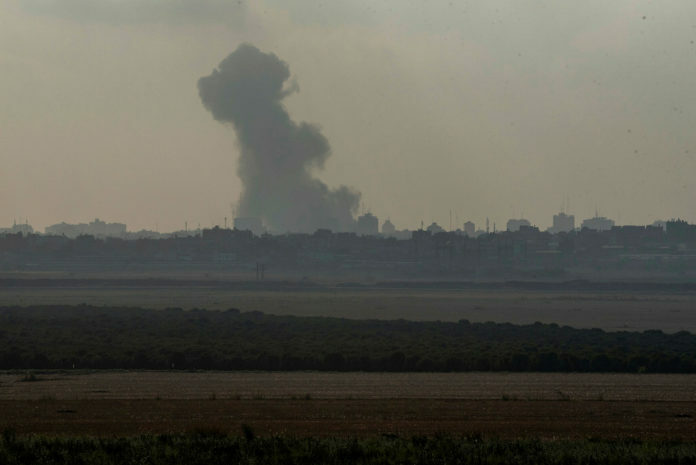 The IDF struck some 80 terrorist targets in Gaza overnight in response to 30 rockets fired at Israel, a military spokesman said early Saturday morning. At 5:45 a.m., the IDF said fighter jets, attack helicopters and UAVs had hit targets including two advanced weapons manufacturing facilities in al-Attara and the Netzarim area; five military compounds in Khan Younes, Dir al-Balah, Tel Za’atar and Jabliyah; a training compound in Rafah, a terror tunnel in Khan Younes and an anti-aircraft observation post in Beit Lahiya. The rocket attacks began at around 10 p.m Friday, with barrages launched against the town of Sderot and the Sha’ar Ha’Negev Regional Council. No injuries were reported, although several people were treated for shock. Hamas and Islamic Jihad issued a statement saying fire would be met with fire and blood with blood. The rocket fire came after a day in which five Palestinians were killed during the weekly violent demonstrations along the Gaza border. IDF attack helicopters and drones struck three Hamas targets after fire bombs and grenades were thrown at Israeli forces along the border.